Earlier in the day the American Numismatic Association (ANA) sent out an e-mail notice letting members know ANA Money Museum Curator Douglas Mudd would be discussing the history, design and current use of the $1 bill on the Fox Business Network. Unfortunately, the odds would have it that many likely read the e-mail only after the interview took place, which occurred at 12:45 p.m. (ET). Or, the daily business routine made it impossible to watch. 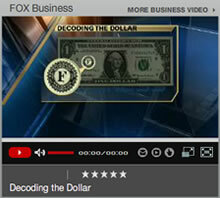 The good news is that the Fox Business video entitled, Decoding The Dollar, is now available online and embedded below. The unfinished pyramid and "all-seeing eye"
The letters "in the circle"
Million Dollar Bill Bogus in More Ways Than One?